Margaret Ogilvie | Ismaili.NET - Heritage F.I.E.L.D. Professor Margaret Ogilvie is a member of the first Board of Directors of the Global Centre for Pluralism. Professor Margaret Ogilvie is Professor of Law and Chancellor’s Professor at Carleton University, Ottawa. 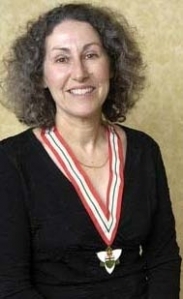 Dr. Ogilvie is a Fellow of the Royal Society of Canada (1993) and a recipient of the David W. Mundell Medal (1996) for legal scholarship, the Law Society Medal (2001) from the Law Society of Upper Canada, and numerous honourary doctorates in recognition of her contributions to the legal profession, both in Canada and abroad. She has served on several boards in the not-for-profit sector in Canada, such as the Centre for Cultural Renewal. In 2008 she was invested into the Order of Ontario in recognition of her lifelong achievement as an educator and legal scholar. His Highness the Aga Khan, 49th Hereditary Imam of the Shia Ismaili Muslims and Founder and Chairman of the Aga Khan Development Network is in Ottawa on the occasion of the inaugural board meeting of the Global Centre for Pluralism. His Excellency the Right Honourable David Johnston, Governor General of Canada welcomed the Aga Khan in the Reception Room at Rideau Hall on Thursday, October 7, 2010, at 7 p.m.